Home » News » A big week in sage-grouse news! Hopefully many of our members and supporters got out to see sage-grouse courtship displays this past spring. The sights and sounds of a lek at daybreak are truly impressive, and serve as a powerful reminder of Nature’s beauty and mystery. 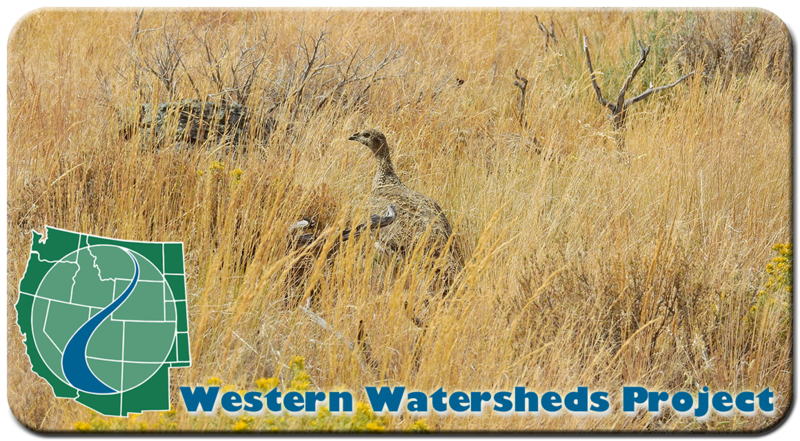 Western Watersheds Project has been working hard to protect the iconic sage-grouse and the public lands it calls home, and this week there’s been a lot of news to keep up with. Western Watersheds Project and our co-plaintiffs, Center for Biological Diversity, WildEarth Guardians, and Dr. Clait Braun, reached an agreement with the U.S. Fish and Wildlife Service to drop our lawsuit seeking “endangered” status for the species and instead maintain the insufficient “threatened” status under the Endangered Species Act. In exchange, the U.S. Fish and Wildlife Service must produce full recovery plan for the species in the next 30 months. Our hope is that the forthcoming recovery plan will protect the imperiled Gunnison sage-grouse sooner than a court victory would, and we’ll be giving the recovery plan the legal scrutiny it needs to make sure it has meaningful recovery measures. Fingers-crossed news: We’re suing to block “energy dominance” in sage-grouse habitats. Western Watersheds Project and Center for Biological Diversity (represented by Advocates for the West) filed a new lawsuit this week challenging the Trump Administration’s leasing of nearly 2 million acres of the most important sage-grouse habitat for oil and gas drilling. The lawsuit targets the Bureau of Land Management’s approval of eight massive oil and gas lease auctions in Nevada, Utah, Montana, Wyoming, and Idaho. The complaint can be found online here, and media coverage of the case can be found here. Since its earliest days in power, the Trump Administration has been seeking to undermine the 2015 Obama-era sage-grouse plan amendments that minimally restricted extractive uses on public lands in the sagebrush sea. Western Watersheds Project and our allies (again, represented by Advocates for the West) have already sued over the 2015 plans unscientific insufficiencies, but these latest proposed revisions take the earlier amendments from bad to worse. The current draft proposed plans back down on protecting important habitats, managing grazing for sage-grouse nesting and brood-rearing requirements, and walk away from closures and restrictions on energy development. Western Watersheds Project will be looking closely at the new proposals and drafting key points and comment suggestions for member use. We’ll be back in touch when we’re ready to help you weigh in with the agencies about the specific flaws of the new plans. It’s “all hands on deck” to save the sagebrush sea. You can follow us on Facebook and Twitter for up-to-date developments and news about sage-grouse and other species.